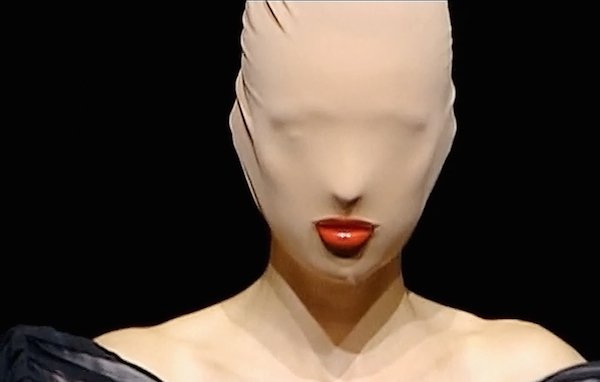 ‘The Artist is Absent’ – an insider short film on Martin Margiela. My true admiration for master Margiela is profound. I know his work from the start, although at that time I could not afford his clothes. But I know about the memorable subway station show, the covered/masked faces in every show so delicately different from one and other, the brilliant make up-time after time- by Belgium’s best make up artist ever Inge Grognard, the wigs flowing over in hair-made coats, the bedcover coat (I got one!!) and much more great stories about Martins rebellion against a tide of commercialism that gamed out creativity. Fashion became more and more dominated by the cult of personality (at this moment it completely took over) so Margiela’s refusal to claim the credit for the stardom he did not want is most remarkable and a statement in a celebrity driven world. “Martin Margiela is different to others because he never compromised his point of view,” explains fashion curator Olivier Saillard in this new film supported by YOOX and directed by Alison Chernick, which explores the career of the mysterious Margiela. “The Artist is Absent” focuses on Margiela’s choice to remain anonymous. The film showcases rare footage of early Margiela shows. You witness audiences packed together in tight spaces, kids running onto the catwalk and blank anonymous models because Martin could not pay the photo rights of them in the early days. No supermodels at the MM shows, but faces obscured by masks, hair or paint. Margiela wanted to get rid of all distraction from a person or a face, and let professionals focus on what fundamentally mattered to him: the clothes. Here I see a link with the statement Li Edelkoort expressed begin 2015, where she predicted a new area: Fashion is dead, long live the garment. Back to the materials, the textures, the coupes, the finishing’s, le “métier” as the French express so beautifully. The movie was originally screened at the Tribeca Film Festival, and traces the history of this legendary designer, from his deconstructionist days in the ’90s to the end of his reign in the mid-’00s. Film director, Alison Chernick, before starting this project, spoke to Martin briefly, who only gave her a list of people who would be good to talk to. Typical. “The Artist is Absent” is a rare insight into the mind of Margiela, by his friends and inner circle. Only 20 minutes, a very modest length of a movie, like Martin always was. The Artist is Absent is produced by Yoox Group. Movie courtesy of Yoox Group, picture courtesy of Martin Margiela. Previous PostTried & enjoyed: The Brooklyn Hotel Amsterdam. Next PostThe Selfridges’ Agender project in London.